Long known (since 1840 in Macomb Co.) and possibly even native in rich forests on banks and floodplains of the Clinton and Black rivers in Macomb and St. Clair Cos. Clearly an escape from cultivation elsewhere in the state, along roadsides and in thickets. 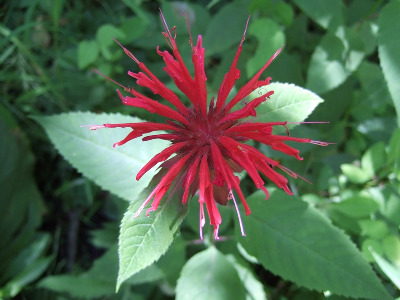 Monarda ×media Willd. is presumed to be a hybrid between M. didyma and M. fistulosa. Such plants have large colorful flowers, as in M. didyma, but more purple than red and with the throat of the calyx prominently bearded. 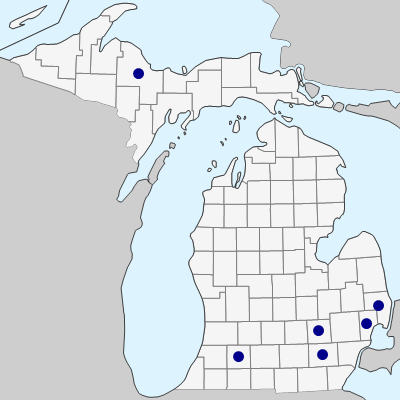 The status of Michigan collections of M. ×media is not clear; they could be direct escapes from cultivation, or they could have resulted from hybridization between garden plants of M. didyma and wild M. fistulosa. Such plants have been collected in Alpena, Kent, St. Clair, and Wayne Cos.
MICHIGAN FLORA ONLINE. A. A. Reznicek, E. G. Voss, & B. S. Walters. February 2011. University of Michigan. Web. April 22, 2019. https://michiganflora.net/species.aspx?id=1573.